The Crusaders fought back from 29-0 down after 29 minutes to beat the Waratahs 31-29 in Christchurch on Saturday. MARIETTE ADAMS reports. What a game. What a result. The Waratahs were simply too good for much of the first half and looked sure to end their 14-year drought against the Crusaders in New Zealand. But the champions clawed their way back into the contest like only they can, although poor discipline by the Waratahs aided the comeback. Despite all the off-field controversy surrounding Israel Folau, the Waratahs fullback was in devastating form in this fixture. The Crusaders targeted him with long, uncontested kicks but Folau, with his supreme aerial abilities, was unplayable. An uncompromising defence saw the Waratahs stave off the initial attacking threat on their line and turn possession over. From there, they worked their way downfield and with only four minutes on the clock, wing Cameron Clark scored the first try. Bernard Foley skewed the conversion, but did extend their lead with a penalty. The Crusaders were unnerved by the visitors’ blistering start and soon found themselves trailing by 29 after Taqele Naiyavaroro’s intercept try, followed by scores from Folau and Curtis Rona. Leaping high in the air, Folau continued to burst forward before a neat one-two interchange with Kurtley Beale saw him dot down. Folau also had an influence in Rona’s try as he ran onto Foley’s high kick-pass and offloaded in the tackle. George Bridge slapped the ball down, only to have it land in the path of Rona, who scooped up possession and scored. But then came the Crusaders’ surge in the last 10 minutes of the first half. Front rowers Joe Moody and Codie Taylor crashed over to get the hosts on the scoreboard. 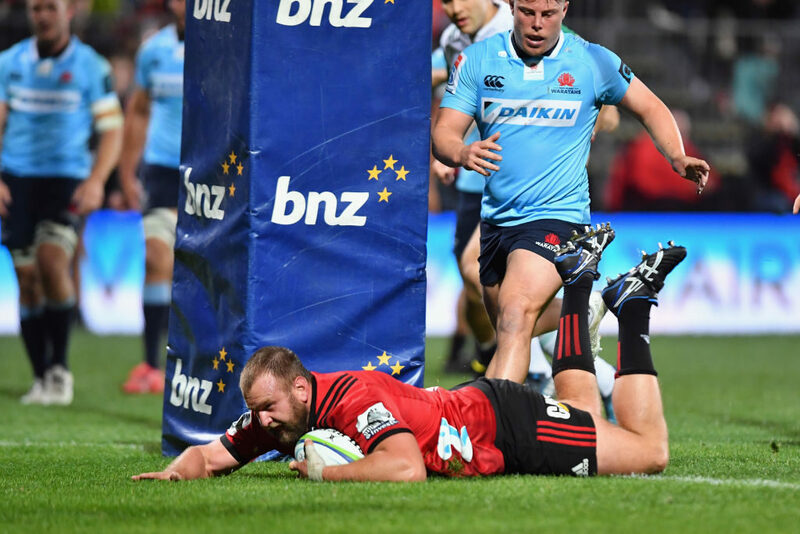 And with the Waratahs’ linespeed – which was so effective earlier on – waning, the Crusaders broke out from deep, well into stoppage time in the first half. And while a kick ahead handed possession back to the Waratahs, the visitors were penalised for playing the ball on the ground; allowing the Crusaders to set a lineout. When Nick Phipps was sent off for a cynical infringement, the Crusaders called for a scrum. They went wide to winger Seta Tamanivalu, who powered through the double tackle of Folau and Beale to score. With the lead sliced to 10, the Waratahs completely capitulated in the second half. They were deprived of possession and territory, their defence was breached with ease, their discipline was non-existent and Foley’s kicking range let him and the team down horribly. When the Waratahs were reduced to 14 men after Naiyaravoro was sin-binned for a deliberate knockdown, replacement Braydon Ennor touched down to make it a five-point game. 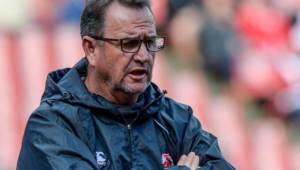 Foley then missed a regulation penalty attempt, which he was made to rue as the Crusaders surged downfield again before receiving a penalty try to take the lead for the first time in the match. It set up a frantic last 10 minutes. Suddenly the Waratahs were able to hold onto possession for longer sequences and they looked dangerous when they did. And when a kickable penalty came their way, Foley sent the ball wide yet again. The visitors would launch another attack, but the Crusaders flooded the breakdown to win a penalty and Richie Mo’unga knocked the ball into touch to end the game. Crusaders – Tries: Joe Moody, Codie Taylor, Seta Tamanivalu, Braydon Ennor, penalty try. Conversions: Richie Mo’unga (2). Waratahs – Tries: Cameron Clark, Taqele Naiyaravoro, Israel Folau, Curtis Rona. Conversions: Bernard Foley (3). Penalty: Foley. Subs: 16 Andrew Makalio, 17 Wyatt Crockett, 18 Donald Brighouse, 19 Mitchell Dunshea, 20 Heiden Bedwell-Curtis, 21 Mitchell Drummond, 22 Mitchell Hunt, 23 Braydon Ennor. Waratahs – 15 Israel Folau, 14 Cam Clark, 13 Curtis Rona, 12 Kurtley Beale, 11 Taqele Naiyaravoro, 10 Bernard Foley, 9 Nick Phipps, 8 Michael Wells, 7 Michael Hooper, 6 Will Miller, 5 Rob Simmons, 4 Ned Hanigan, 3 Sekope Kepu, 2 Damien Fitzpatrick, Tom Robertson. Subs: 16 Hugh Roach, 17 Harry Johnson-Holmes, 18 Shambeckler Vui, 19 Tom Staniforth, 20 Jed Holloway, 21 Jake Gordon, 22 Lalakai Foketi, 23 Bryce Hegarty.